Do the exercises in the following order. Do 10 reps and three or four sets. Rest for 2 minutes before starting next set. “Load the bar so it makes each set challenging for you,’ says Inger. Grip bar at shoulder width. Keep spine neutral and stand up, keeping torso in the same angle while bar is below knees. After bar passes knees extend hips to a standing position. Keep bar in contact with bar at all times. Reverse process when lowering the bar. Place the kettlebell between legs, feet slightly wider than your shoulders. Keep neutral spine and torso as vertical as possible. Bend down to pick up the kettlebell with both hands. Stand tall, knees tracking toes. Position bar chest high with torso tight. Retract head back while pressing bar overhead until arms are fully extended. Keep dumbbell lateral from the shoulder joint elbows pointing down. 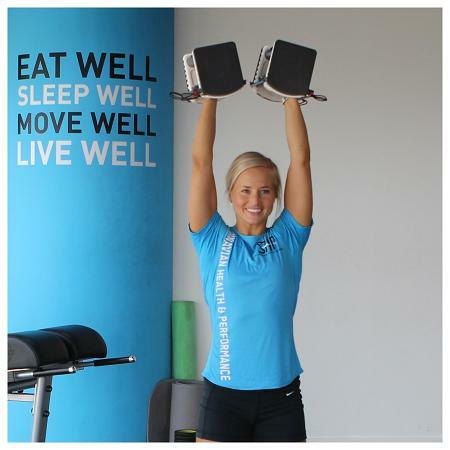 Press dumbbell straight up until arms are fully extended. Rest bar on shoulders and keep weight towards heels. Keep neutral head and spine throughout movement. Sit back and down keeping chest up. If mobility allows, let hip joint come below knee joint. Knees track over second toe. Drive up though heels. Same movement as the squat, but instead of resting a bar at shoulders, hold a kettlebell with both hands in front of body. Grab bar with underhand shoulder-width grip. Pull up until chin is above the bar. Lower body until arms and shoulders are fully extended. Use elastic band for assistance if needed. 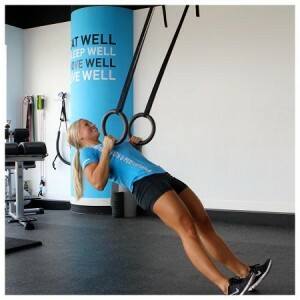 Lay as horizontal as possible under rings. Keep body straight and pull body towards rings until chest is at level with rings. Return until arms are extended. Rest bar on shoulders. Lunge forward so that rear knee gently touches the floor. Drop body straight down after front foot hits floor and keep forward knee over second toe of front foot. Keep spine neutral. Do lunge holding dumbbell to the side or using bodyweight only.